Are you tired of looking at those ugly, damp, cold concrete basement walls? If so, it's time for an upgrade! All of our basement wall panel systems stop water vapor from coming through the walls and resist mold and mildew. The experts at Ayers Basement Systems can help you select the solution that's right for your needs. To request a free in-home consultation and estimate in Kalamazoo, Lansing, Grand Rapids, Traverse City or nearby, give us a call or click below. We can repair your damaged basement walls permanently with our Everlast™ Finished Wall Restoration System. This system works great with our other products, including our drainage system and basement flooring. These panels also add insulation to the basement, creating a warmer, more comfortable space. The washable surface looks great for years to come and includes a 50-year Warranty (contact us for full details). What could be better than that? These Jackson, MI homeowners initially contacted us to repair several cracks in their foundation walls. After fixing this issue with our FlexiSpan crack repair system, we returned to the home to assist them in finishing their basement. Our basement finishing team upgraded the outdated wood paneling and carpet with new, sturdy EverLast cement board wall panels and ThermalDry tile. This tile is the only plastic, all-inorganic subfloor in the world, preventing mold growth and providing a durable, yet appealing floor. With new walls and flooring, this basement received a facelift that will keep it a dry, comfortable living space for years to come. The block wall in the before photo had been leaking into the home quite a bit. The space between the blocks created easy access for groundwater to break through. You can even see where the water had stained the wall on its way down. Our fix in the after photo is the BrightWall system. The white panels of BrightWall are a moisture barrier system that keeps water out of view in the basement. As water leaks in through the block wall, it will be escorted down the wall and into a drainage system that sits in the foot and wall joint. The perimeter drainage system WaterGuard sits under the footing of the ground and will carry the water out to be discharged. As a system, BrightWall will solve the leaking problems that this basement has been dealing with for a long time. Whether you're thinking about finishing your basement or not, we offer versatile basement wall solutions that can give you a drier, brighter, more comfortable basement. 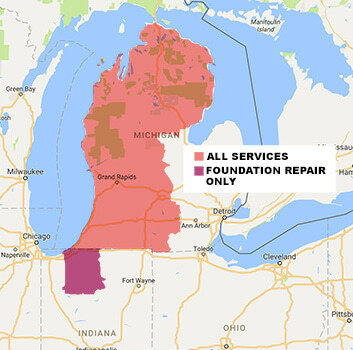 We offer free estimates on all our basement waterproofing products and services in Jackson, Muskegon, Battle Creek, Traverse City, Niles, Alpena, Mount Pleasant and nearby. Contact us today!